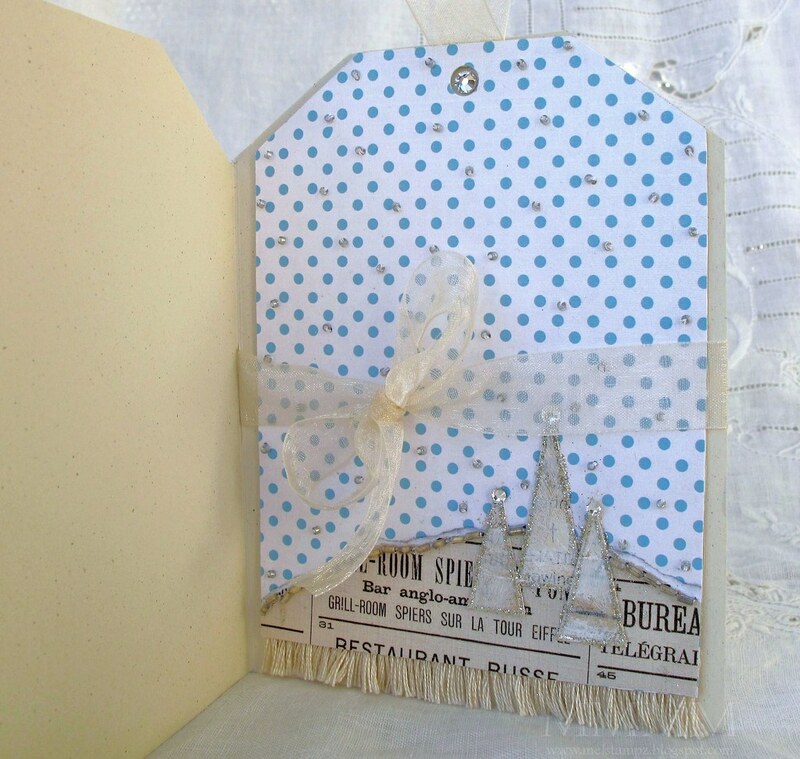 die cut tag card in this post (if ya missed it). if you want to pop back in sometime. This is made with the Creative Cuts & More Tag Card with Tag (Side Opening--in coconut swirl) but it comes in loads of lovely colours. Step 3} Pierce a line along the snow (for the buggle beading). Step 5} Sew on the buggle beads. Step 6} Pierce holes for beads of snow. On this tag (for the inside of the card) I pierced randomly. But on the front of the card, I pierced the blue dots in the patterned paper. 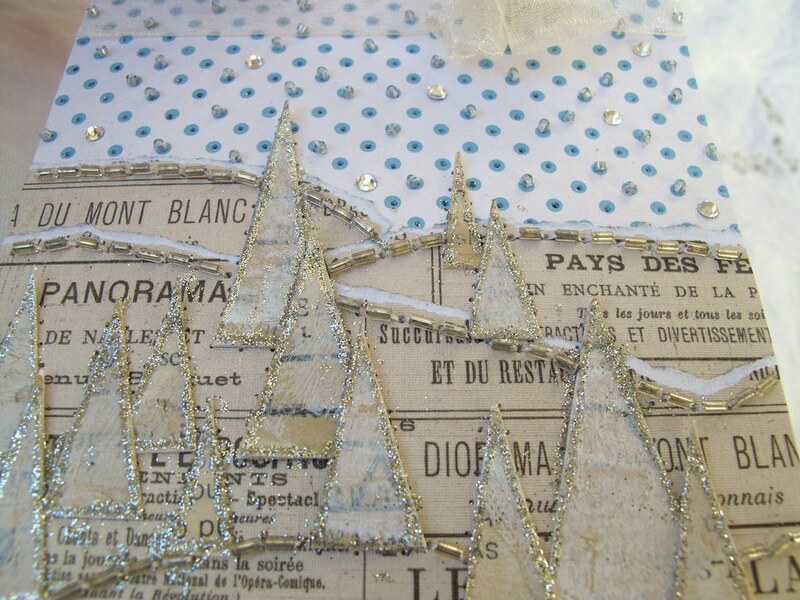 Step 8} To glitter, write around the edge of your trees with a quickie glue pen. Step 11} If you're really messy & glitter bits are stuck on the glue, a pair of scissors works well to gently scrape it off. short as you like & all kinds of colours. Step 13} Adhere crystals to the tops of the trees. Your creations are amazing!! Just beautiful! Thanks for the inspiration! 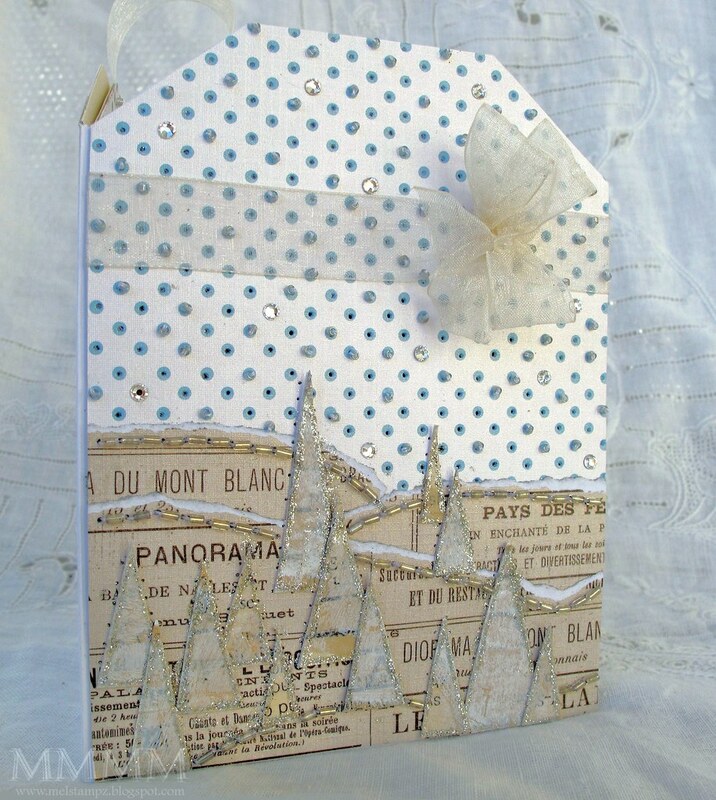 una hermosisima card!me encanta el tema y sobre todo que cosiste con canutillos !tiene un toque vintage que me encanta!gracias por el tutorial! I'm too lazy to do all the beading as pretty as it is. But the glittery trees are what reall caught my eye. I really like that as even a backdrop behind a colored image. I will be trying that for sure. Omigoodness, this card is just PERFECTION! I love everything about it--the trees are beautiful, the beading is an awesome touch and (oh my) the fringe. I so love all your work, Mel and appreciate all the time you put into sharing. You are too generous, but we love you for it. But this, *this* was just the very best thing EVER. I can't even really say what it is that pushes it over the top for me. Perhaps the colors? The beading? The text type paper that I would never have thought to use that way? Those gorgeous trees with glitter? Dunno. What I do know is that you're genius. Pure, unadulterated genius. oh Mel, so many things about this I love! First of all I love the jeweled snowflakes, and the trees are really cool looking! You have such patience when you craft! Your creations are amazing and your tutorials are fantastic! I think I only managed this "performance" twice in my cardmaking life. I really love the color scheme, the vintage look and the sewing is just something that works so well for me! I find myself in awe of your skills and imagination. I am almost textless! Love it all. One word....Wow! Okay, two more. Love it! I am sure that I missed this post the first time. Phenomenal work! I am going to try embroidery fringes once I master the beading thing....and get a needle that works, heehee. Thanks Mel for being so willing to share what you do so well.